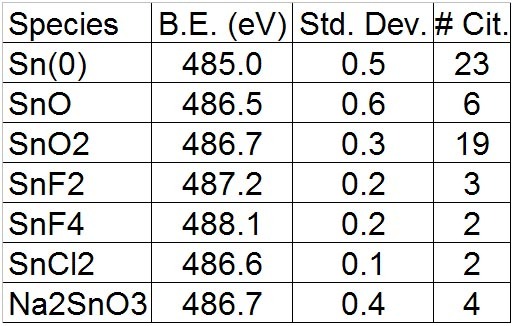 Chemical state assignment for tin is difficult due to overlapping Sn 3d5/2 values for SnO and SnO2 (see Table 1.). The Auger parameter and Auger spectral shapes may be helpful here (click for post). Table 1. 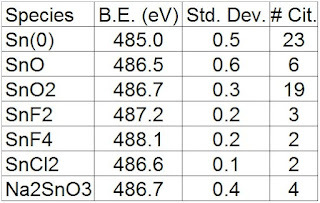 Sn 3d5/2 binding energy values. Sn(0) - 484.90 eV, 0.59 eV FWHM at 10 eV pass energy, slightly asymmetric peak-shape defined by LA(1.2,1.5,5).